When people try to fix their business' own broken electrical components, they're actually risking their lives. There's a reason we have professional electricians. Most homeowners don't know enough about electricity to work on their homes. In the construction industry, electrocution is one of the "Fatal Four" workplace-related injuries. If professionals dealing with electricity every day are prone to injury, injury is likely for your average person. The next time your business, large or small, needs electrical work, call an electrician. Not only could it save your life, but it'll more than likely result in higher-quality work. 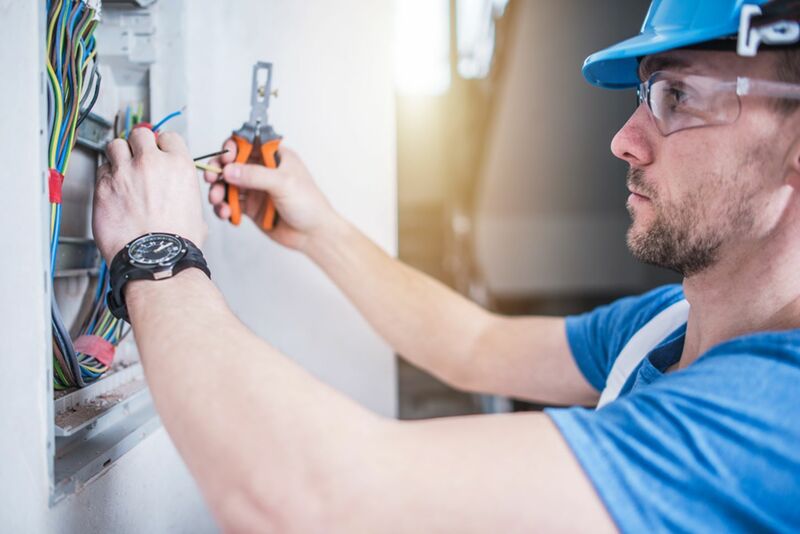 So today, we're breaking down our guide to hiring an electrician for your business needs. Whether it's new wiring or a faulty plug, just turn to our guide for help. Let's get started. If our guide teaches you nothing else, make sure you are only hiring licensed and insured workers. Any electrician without licensure or insurance isn't worth hiring. Ever. That said, there are two types of licensed electricians. First, the journeyman electrician. They're the "entry-level" electrician and have taken coursework to qualify as a practicing electrician. But journeymen still have state licenses, and also thousands of hours of work needed to qualify for journeyman status. They can install wiring and equipment but they can't design electrical systems. The other type of electrician we call master electricians. They're what you could consider the "experienced" electricians. Master electricians have at least two years of experience and have passed a standardized test. The test qualifies them as proficient in the National Electrical Code and any additional state regulations. If your business needs an entire system redesign, a master electrician is the only person for the job. Electricians carry insurance to protect both themselves and your business. If anything occurs while they're working, you're both covered. Though the chances of disaster are slim, it's better safe than sorry. The electrician's insurance works with your insurance to cover your losses if any damage occurs. Likewise, if bad wiring causes long-term issues, insurance can also mitigate your costs. And beyond your own business, insurance protects electricians from their own mistakes. The electrician's insurance will protect them from lawsuits. Electricians willing to protect their liability are more trustworthy than those risking lawsuits. Simple mistakes could easily cost thousands without insurance. Any reputable electrician knows the local building and electrical codes. Always ask them about your own building needs, and if they'll fall in line with what's allowed by local code. Any good electrician knows off-hand what's allowed and what isn't. Chances are they aren't experienced if they always reach for the written code. Or, they don't care enough to memorize the local code. Though in complex circumstances electricians should look up the code before starting work. Anyone who doesn't verify unusual situations is likely overconfident in their work. Always look for an electrician who fits your very specific needs. Look for someone experienced working on commercial buildings rather than private homes. It's also good to find someone who's experienced in fixing the specific issue you're having. The more experience they have, the better chance they'll have an easy fix to your problem. Plus, they'll also do higher-quality work. Likewise, commercial electricians have experience working with large-scale electrical projects. While wiring a plug in a private home is straightforward, outfitting business space easily gets complex. Find an electrician worth talking to before asking questions and looking at specifics. Don't waste your time with electricians that people have already uncovered as untrustworthy. And the key to uncovering electricians worth your time? Yelp reviews and websites like Angie's List. Though remember that people are prone to leaving negative reviews, not positive reviews. Sort through your review site of choice and find electricians with good ratings. Next, create a list of the best and call them to find out the above information. In addition to online reviews, it's also good to ask around your area for recommendations. Other local businesses might have had similar work done and know an electrician that's perfect for your needs. Yelp helps narrow down your list, but in-person recommendations lead to detailed information. No one knows local businesses like the local people in your community. While Yelp gives general information, in-person recommendations tell the specifics of each electrician. You can usually find price information, how long they take, the work quality, and more. When hiring an electrician for your business, sometimes the easiest method is the best. It's not always difficult to find someone who can take care of your electrical needs. If you follow our guide we're hoping you can find just that. However, if you're in a rush or looking for an easier way to find the best electrician, get in touch with our experts. We specialize in all parts of the electrical business. We train our staff in commercial spaces, making our team is diverse in their specialties. They have the collective knowledge to tackle any problem that might arise. Whether you need an entire rewire or just some new lights, our professionals are perfect for the job. We strive to fix your problems the right way, every time. If you want to find a respectable and qualified professional, then you need to look for your own electrician. Don't hesitate to get in touch with us as soon as possible.